Scotland backs coach Jason O’Halloran believes that new recruit Huw Jones moving to either Edinburgh or Glasgow would be the ideal scenario. The 22-year-old Stormers centre has been drafted into the Japan tour squad which flies out on Saturday and, although he is contracted to the South Africa-based Super Rugby outfit through next season, the Kiwi attack chief admits having him integrated into the Scottish system would be a positive step. “I would definitely agree, that would definitely make sense,” said O’Halloran. “But in terms of how that process goes, it is up to various parties to work out. Former Hurricanes centre O’Halloran remains a keen follower of Super Rugby and says Jones, who is trying to shake off a foot strain in time for the first Test in Toyota City on 18 June, caught his eye when he scored a try in a 25-20 loss in Wellington last season. “He played against Hurricanes last year, and I thought he played really well in that game, and ever since I’ve thought he’s quite a good footballer, this kid. “We were aware of his Scottish background – that he was born here. He had been on the horizon for a while. I think Glasgow had tried to make something happen the last couple of seasons. So we were well aware of that possibility. “He can play either position. I know he does prefer 13, but I see a skill set in him that lends itself to both positions, because he can catch and pass to width really well, which means he can play at 12 pretty effectively as well. I like his make-up. “He hasn’t been able to do much with the foot at this stage. But what we see in him is a guy who is a really good ball-carrier. He’s a good distributor of the ball as well, and builds more depth in that area where we’ve got reasonable depth. 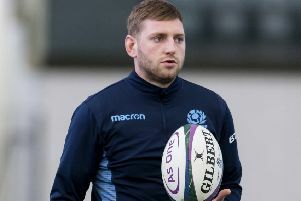 Jones was called up when Finn Russell received his shocking head injury during the Guinness Pro12 semi-final at Connacht and O’Halloran said that Peter Horne’s ability to back-up Ruaridh Jackson at stand-off prompted them to add another midfielder. “We’ve got Peter Horne there, and I guess in a worst-case scenario, if we did pick up a couple of injuries, Greig has spent a little time there with Gloucester as well, so that’s a fall-back. “We felt Ruaridh played well there against Wales when he came on early in that [Six Nations] game for Hoggy and got 60 minutes at full-back. O’Halloran joined Vern Cotter’s team after the World Cup and has now had a couple of months to reflect during the Six Nations and how he felt the attack play went during his first international competition. “Statistically it was good, scoring the most tries for a while,” he said. “Finishing on the positive side of the points differential was a real positive as well. “We can certainly get better, some of that is around our skill set needing to be a lot better – catch and pass, developing more skills with our forwards so that we are not quite so one-dimensional in the way we carry the ball. O’Halloran has experience of Japan having coached Kubota Spears in 2005-06 and he is looking forward to returning with Scotland. “We could have gone the other way and made it more of a development tour but we felt this group is starting to grow together and we wanted to continue that growth by going to Japan,” O’Halloran said of a two-Test series which does offer ranking points in the quest for World Cup seeding. “A lot of the selection strategy is by Vern as head coach and we are 100 per cent behind what he has done here. We want to take away a strong squad. “They are ranked tenth and we are ninth. We are slightly behind France too, only a matter of a few decimal places in those rankings [0.04 of a point], so we want to do well. We feel the group is growing so this is another opportunity to push ahead. After such a long, punishing season, the coach admitted this week’s training camp at BT Murrayfield would not be too physically demanding. He added: “The key is getting clarity around what we want to do. If we can get that, that’ll govern how much we want to do, but we won’t come off the field until we’re happy that they know what they’re doing. Hopefully they won’t take too long.